NH class built 1966 by Kinki Sharyo (Japan) as iron ore hoppers NH900-961 for Commonwealth Railways (North Australia Railway). 903 to Port Lincoln Jan 1978. By Oct 1978 fourteen vehicles (NH901, 903-906, 911, 921, 924, 927-928, 931, 940, 955 and 958) at Port Lincoln. Used on ballast and superphosphate workings. Remaining vehicles to Port Lincoln Mar-Jun 1984. All rebuilt with extended sides for gypsum traffic. Renumbered ENH1-61 22 Jan 1985, in order ex NH901-944, 900, 946-961. ENH24, 30, 31, 44, 45 and 47 written off by Mar 1988. NH945 (not included above) went to Tasmania as QA24, then HA32; to Thevenard Jan 1997, then to Western Australia 2004. NHA class built 1968 by Kinki Sharyo (Japan) as iron ore hoppers NHA962-1006 for CR (NAR). While identical in appearance to the HN class, the NHAs have a lower tare and hence slightly higher load capacity. Seven to Port Lincoln Oct 1978. 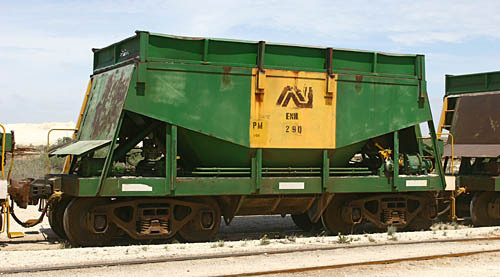 Rebuilt 1984 with extended sides for gypsum traffic. Renumbered ENHA1-7 13 Dec 1984. Thirty-four additional HNAs had gone to Tasmania; twenty of these to Thevenard Jan 1997 as Tasrail HA class, then to Western Australia 2004. The diagrams below show these vehicles in their original CR NH guise. The only relevant difference to their form on Eyre Peninsula is the addition of the 'hungry boards' to increase their capacity for the lower density of gypsum.